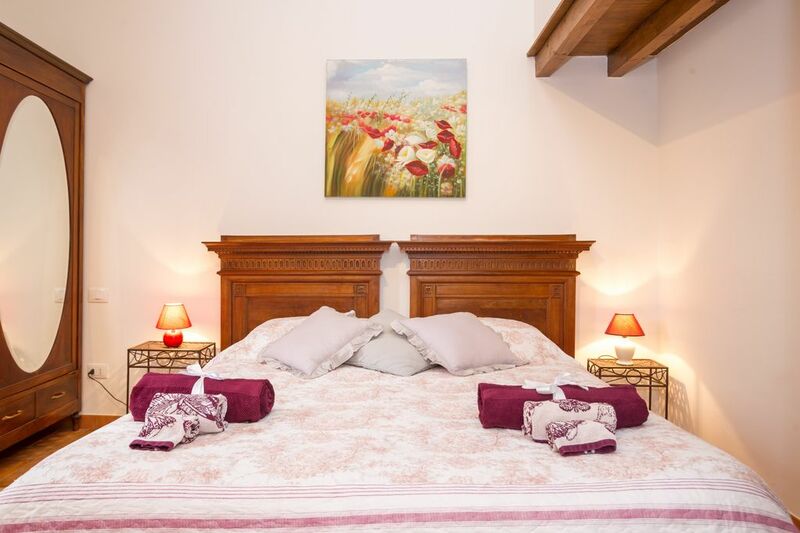 The B & B is located in a very quiet square, inside a building of the twelfth century that housed, in the nineteenth century, the ancient Arciconfraternita di Sant'Orsola, of which you can admire an effigy in peperino over the door of entrance. From the building you can enjoy a beautiful view of the rooftops, medieval towers and hills of Viterbo. The apartment is located in the heart of the historic center of Viterbo in the medieval district of San Pellegrino and consists of a double bedroom, bathroom, living area / kitchen with fully equipped kitchenette, possibility to add extra beds. It is characterized by wooden beams, exposed stones, antique furniture and ceramic tiles, ideal for immersing oneself in the atmosphere of the neighborhood. It is located in a very quiet square, on the second and last floor of a 12th century building where you can enjoy a beautiful view of the roofs, the medieval towers and the hills of Viterbo. Perfect for a relaxing stay!